It’s time for dessert. After tapas and paella, dessert was, well, not exactly Spanish. I wanted to make use of spring-time strawberries and rhubarb and turning them into something frozen seemed right. Since a frozen dessert would be made well in advance, that meant I could put together a few components and nothing would require last-minute attention. When I read The Perfect Scoop , I was inspired by the suggested pairings of sorbets or granitas with ice creams and sauces. I dreamt up a vision of fruity strawberry-rhubarb sorbet served next to a sinfully rich scoop of vanilla ice cream, and I found those recipes in that book. 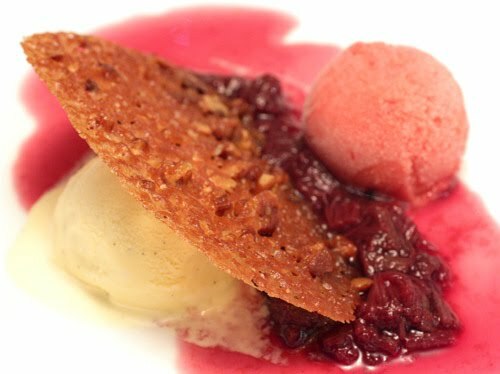 Following the strawberry-rhubarb sorbet recipe, there’s a note about serving it with a red wine-poached rhubarb compote which sounded perfect. Sorbet, ice cream, and compote was a good start, but I thought a nutty, crunchy item would make it complete. For that, I turned to Martha Stewart's Cookies and chose the lacy nut cookie. I had a plan, but I had no idea how to best present those items on a dessert plate. I should probably read a book on plating and presentation. Each part of this dessert was very easy to prepare. For the sorbet, rhubarb was chopped and cooked with sugar and water until tender. That was pureed with strawberries, chilled, and churned into sorbet in my ice cream maker. The next day, I made the custard for ice cream with whole milk, sugar, cream, a vanilla bean, six egg yolks, and vanilla extract. I’ve tried a few different recipes for vanilla ice cream, and I can now gauge how delicious the result will be based on the number of egg yolks used. Six is a lovely number of egg yolks for vanilla ice cream, and it was very delicious. The compote was a simple mix of chopped rhubarb, red wine, sugar, honey, a cinnamon stick, and ground cloves. That combination was simmered until the rhubarb was cooked and the sauce reduced, and then I stored it in the refrigerator. Before serving, I brought the compote back to room temperature. The last item was the cookie. The dough was made from mostly butter but also confectioners’ sugar, corn syrup, bread flour, and chopped pecans. Once mixed, it was rolled into a log, wrapped in parchment paper, and chilled. Pieces were sliced from the dough log and baked on silpat-lined sheet pans. I quickly learned that these cookies spread even more than you would think. The dough log I created was a little big, and I ended up cutting each slice in half before baking. The shape of the dough doesn’t matter so much because it spreads into a circle regardless while baking. The cookies baked into lacy and somewhat fragile wafers of buttery crunch. I ended up with just what I wanted for flavors, textures, fruit, and nuts, but I had no idea how to make it look nice on a plate. Should I have put the compote on the bottom, drizzled it on top, or placed it to the side? What about the cookie? I couldn’t decide how to position it either. It could have been the platform on which everything else sat, or it could have rested on top like a lacy veil over the frozen scoops, or it could have sat in a more vertical pose. I played with the plating and snapped the photos seen here well before dinner time. Then, when it was time for dessert, my final plating decision was to set out a buffet of sorts and invite everyone to help themselves. Problem solved. let me say this as clear as possible: I WANT THIS! Rhubarb was perfect to serve to "Irish" folks. I loved the spiced compote and your cookies. And of course the ice cream and sorbet. Thanks again! This looks nice and refreshing! Sounds so refreshing and looks very pretty too Lisa! Nice! 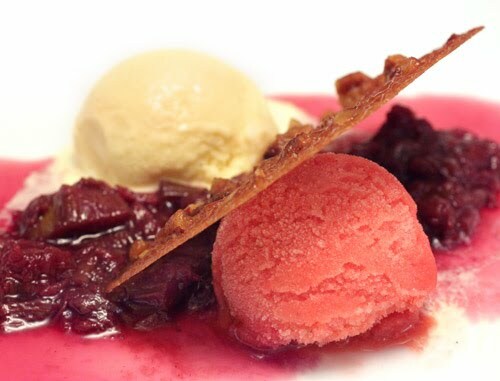 I love the rhubarb in the sorbet and in the compote - delicious! It's rhubarb season. I must try me some this year!!!! I. MUST. Love the lacy cookie. I think you made a wonderful presentation. Your desserts always look "show stopping". What a great way to use spring rhubarb! Wow, this is amazing. Have a wonderful weekend. i LOVE the different shades of red and pink in this dessert! and your brittle cookie is the perfect final touch, both in plating and eating--well done! This dessert looks delicious! All of your little finishing touches (i.e. the brittle cookie, sauce, etc.) make it look like something a gourmet restaurant would serve. Rhubarb is in season! Nicely presented. Ha, Lisa I love this plant, and had a client who used to bring in so much of it for me to cook for him, not just pies, but with beet greens and spices...love this! Lisa, this is a dessert I would serve at the restaurant where I work, it looks delicious! I have some rhubarb I couldn't resist buying so I might they the sorbet, it sounds delicious! Absolutely divine dessert, your picture looks so awesome, I am drooling! So Lisa. "I'll just whip up some ice cream and then make 47 other things to go with it". :) Beautiful as always. Man, I wish I have the opportunity to attend your dinner party, this just sounds incredible. 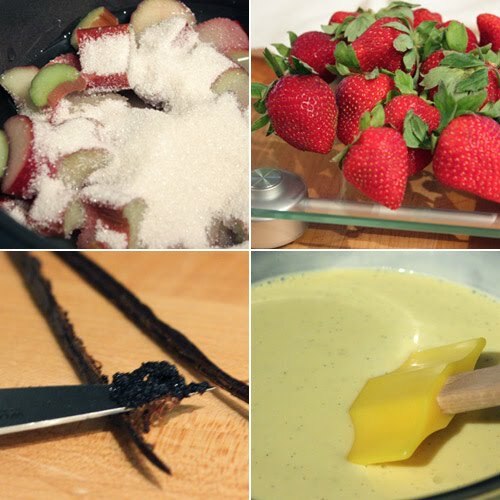 I love rhubarb and strawberries, possibly one of my favorite flavor parings. Just incredible and I think your plating looks gorgeous! Oh I love strawberries. I am going to have to make this sometimes. Looks tasty! You created a beautiful dessert! I especially loved that cookie with these crunchy pecans, yum! and the plating was done fine, it looks great! Beautiful & lovely flavours beautifully combined here! Gorgeous! It looks like something you'd get a fancy restaurant - well done! omg! what a beautiful dessert...so fancy and elegant....great flavors. Great solution to a presentation problem, lol... Whatever the look of the plate, the dish itselfs looks delicious!